Galapagos Sky, the most luxurious live-aboard vessel in the Galapagos Islands is now welcoming rebreather divers on selected departures. Amy Lesh, Marketing and Sales Manager made the announcement earlier today. The two rebreather departures planned for 2017 have 8 open spots each and are expected to sell fast. 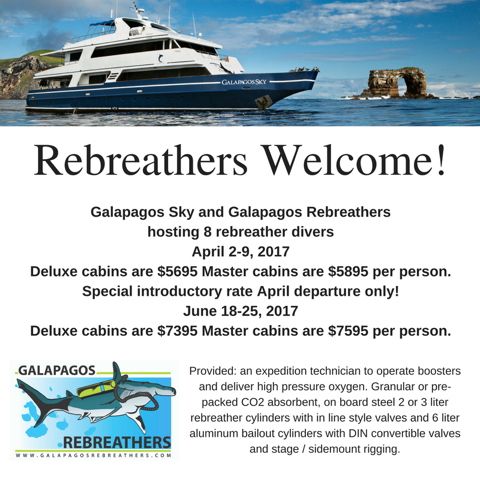 For information please contact Jorge A. Mahauad, Director of Galapagos Rebreathers. Galapagos Rebreathers is a firm dedicated to providing rebreather services in the Galapagos Islands. Our mission is to deliver close and intimate encounters with marine wildlife and promote underwater exploration.